Challenge Detroit – What About After the Fad? What About After the Fad? 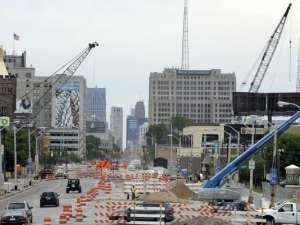 Development is breeding progress in Detroit. People naturally want to be part of a place that is bustling with activity. It creates curiosity and intrigue that individuals want to explore. This is happening everywhere you look in Detroit. Obviously business owners and entrepreneurs believe that the city is a location with a strong economic future or they wouldn’t invest here. However, what I believe is peaking their initial interest is that rest of the development that is already happening. No one wants to be the only one putting their money into a place that no one else. Just like my response to everyone’s age old question, if everyone jumped off a bridge would you? Yes, yes I would. If everyone is doing it there must be a good reason. So if everyone is investing in Detroit then there must be a good reason. While benefiting the city I believe many business owners are putting their business in Detroit because it is the popular thing to do. I imagine that many don’t fully understand the financial pros and cons that may exist, they simply want to be a part of what is happening. I think this is common with most things fashion, technology, sports, etc. These different subjects become a fad; it’s popular, it’s the cool thing to do. Currently Detroit is the cool thing on a national level. It carries with great stories of struggle and success. Businesses want to be able to say that they were there at the beginning, they were a part of the resurgence and renaissance that is “cool”. They helped to turn things around, in return making them cool. How does Detroit sustain this success when the “coolness” wares off? Fads come and go and so will the fad of Detroit. How can we take advantage of the attention and investment Detroit currently to make Detroit a viable place for business and residence for decades to come?